BRISBANE Archbishop Mark Coleridge has delivered a strong message of hope and repentance in an Advent homily to Brisbane’s Neocatechumenal Way communities. 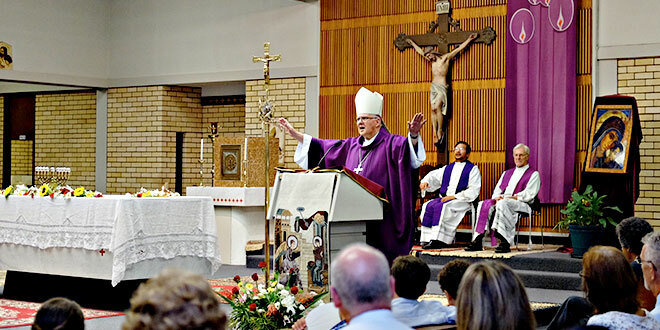 Speaking to the communities, which operate in four Brisbane parishes, during a vigil Mass in St Ambrose’s Church in Newmarket, Archbishop Coleridge described the words of prophet Isaiah (Isaiah 11:16 “The wolf will live with the lamb …) as “a magnificent vision of hope, but a hope that can look like a mirage”. “Because, given the reality of the world, we know the wolf doesn’t live with the lamb – the wolf eats the lamb,” the Archbishop said. “The prophet’s vision can look pathetically unrealistic and to be no real vision of hope at all – a hope that is no more than a mirage. Or is it? “Because what the prophet Isaiah puts before us throughout these days of Advent is a magnificent vision of possibility that comes not from the prophet but from God. “Most of the time we see only a tiny shred of what is possible and we think that’s all that is. “And the only other thing that is certain is that sin in our life and in the world will always shrink our vision of possibility and undermine our hope. “In the end sin always leads to hopelessness”. Archbishop Coleridge said this explained why John the Baptist said “repent” (Matthew 3:2). “In other words acknowledge that you have sinned, acknowledge what it is that shrinks and, in the end, destroys the hope, the vision of possibility in your life, gives you the heavy heart which becomes the dead heart,” the Archbishop said. “But repentance on our part is met by mercy on God’s part. “And once you are forgiven then your eyes are open and you see the magnificent vision of possibility, and you see that what the prophet Isaiah says isn’t just a mirage, it is the truth. “Is it possible for the wolf to live with the lamb and the panther to lie down with the little goat? “The answer is yes, if you’ve got eyes to see. “But you’ll never have eyes to see unless you repent and in that sense recognise that you are blind and then receive the free gift of mercy that cleanses your eyes, opens them to see the truth of what the prophet says. “So right throughout these Advent days there is the summons to a new hope, a new vision of possibility, but that’s why also during these Advent days there is a summons to repent. Archbishop Coleridge meets regularly with Brisbane’s Neocatechumenal Way communities which formed in 1984 and operate in the parishes of Jubilee; Guardian Angels, Wynnum; St Matthew’s, Loganholme; and St Columba’s, Wilston.